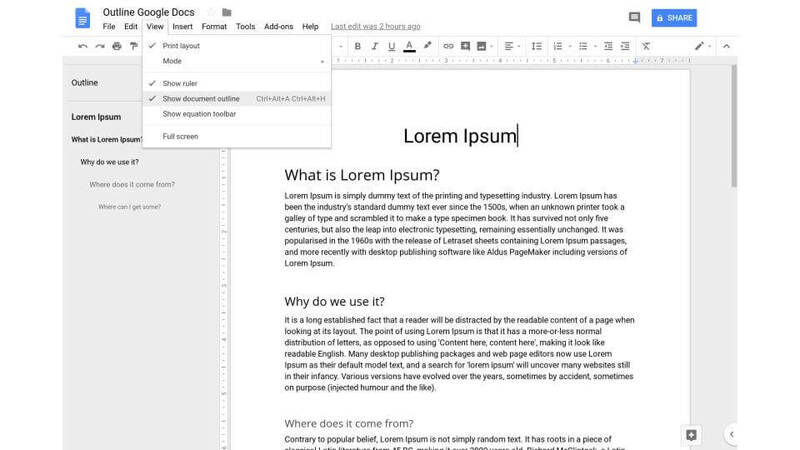 The Google Docs outline tool is a great way to quickly navigate the different parts of your documents. The outline may be used to ensure every intended topic is covered. Moving around in lengthy documents is very easy using the Google Docs “Outline” tool. Simply stated, the outline tool bookmarks the title and all headings in your document. This list of bookmarks is presented as a left sidebar of your content. Note: Subtitles will not appear in the outline. On the left side of the document next to “Outline,” click the “X” to the right of Close. The outline will stay closed until you open it again.